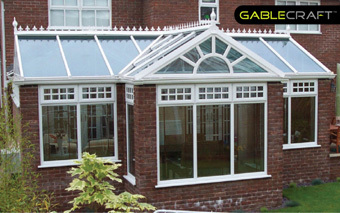 Few styles capture the proud architectural heritage of the conservatory quite like the gable front. 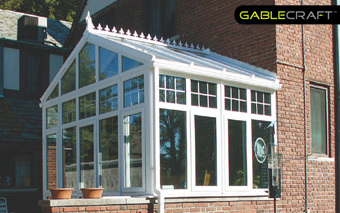 Reminiscent of the grand orangeries and classical conservatories of yesteryear, this type of conservatory enjoys an imposing front elevation with the windows extending to the apex of the roof. As a result, it enjoys a real sense of presence and can add a feel of stately splendour to any home and particularly older, period properties. 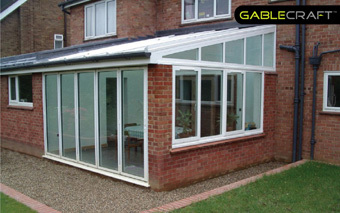 If you`re looking for a conservatory that takes your breath away every time you look at it, then this is definitely the style for you. The main choices to consider are whether you like the vertical mullion design (for example the GC-G4), the radiating bar design (such as the GC-G10) or you may prefer one of our large selection of the sunburst designs (like the GC-G16). Often picked for its simplicity and Tudor styled appeal it is by far our most popular design. This design offers clean lines and can sometimes offer perfect symmetry with the window frames below. The design pictured to the right is a GC-G4. This design provides you with the effect of the suns rays over the horizon similar in design to the sunburst but without the curved transom. The design pictured to the left is a GC-G10. One of our most popular designs and comes in a variety of styles and spoke variations from between 3 and 7 spokes. As its name suggests it portrays the sun halfway over the horizon with its bars radiating from the curved transom. 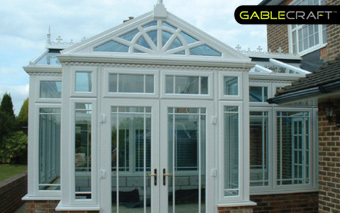 Generally more suited to larger conservatories, the cartwheel offers a similar affect to the sunburst but with the radiating bars cutting through the curved transom to a point, like a cartwheel. The design pictured to the left is a GC-G28. Similar in design to the sunburst but instead has 2 curved transoms for twice the effect. 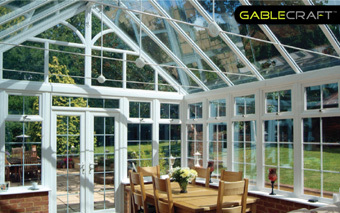 This design is most definitely suited for larger conservatories. The design pictured to the right is bespoke. Due to the roof design generally leaves right-angled triangles at the sides which can be filled in a variety of ways. The most efficient & esthetically pleasing way is by using a raked frame. 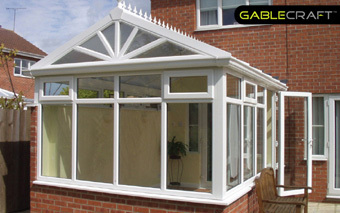 Raked frames are available in a few different design options as shown below and can ring prominent appeal to the most basic of conservatory. 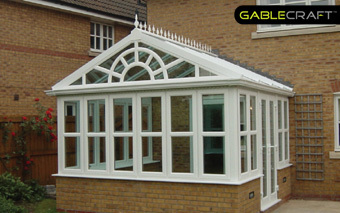 Generally understated in design this style of frame is used on the sides of lean-to styled conservatories and some P-shaped designs. This small handful of design options can often compliment the Tudor styled house beautifully. The design pictured to the right is a GC-R4. The design pictured to the left is a GC-R4. Due to the bespoke nature of our products, every frame is hand made by our skilled craftsman. Because of this we are able to produce frames to suit your very own design within reason. Maybe you have a particular feature on your house you may want to copy or you would just like to portray some of your own personality, its up to you.